This batch of breast milk soap contains lots of lard because it's for cold winter day use. 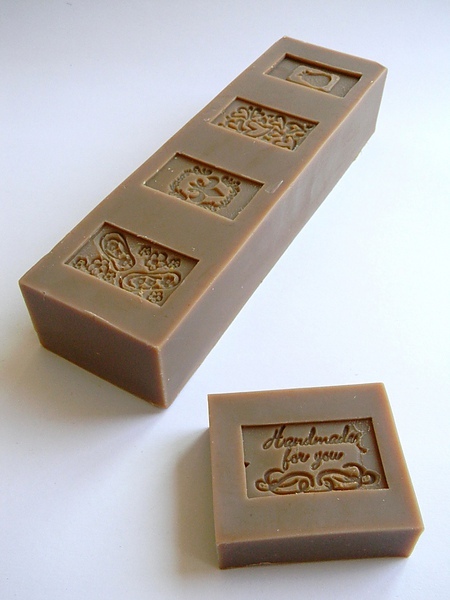 I found that I pretty like the firmness and hardness of lard soap, and moreover, lard soap holds scent longer! The only thing I don't like is, lard soap can't lather well in hard water. There's no any colorant added to this soap but it turned out dark brown like caramel as above pic shown. I was wondering how and why it happened because the soap was off-white at first like pure lard, then it turned golden yellowish brown after few days, then it's getting darker and darker, ended up like a caremel fudge. Ingredients: lard, coconut oil, sunflower oil, castor oil, hemp seed oil, breast milk, fragrant oil of baby powder + vanilla bean. I Love Lard! If you are less than impressed with its lathering power, try tallow instead. 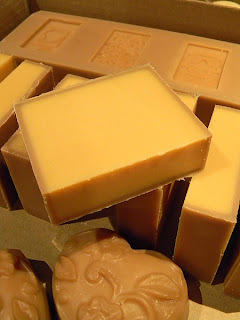 Tallow (in my opinion anyway) makes better soaps in terms of lathering and moisturizing. What a beautiful soap! I like the stamps.